The Madden-Julian Oscillation (MJO) Task Force (hereafter MJO-TF) has the goal to facilitate improvements in the representation of the MJO in weather and climate models in order to increase the predictive skill of the MJO and related weather and climate phenomena. 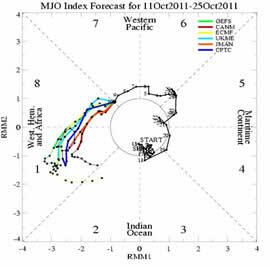 The MJO-TF was initially formed in 2010 under the banner of the Year of Tropical Convection (YOTC) activity following the earlier success of the US CLIVAR MJO Working Group (from 2006-2009). Successes were achieved in making a set of MJO simulation diagnostics as well as in the establishment of an activity to monitor and compare MJO forecasts in real time. At the beginning of 2013 the MJO-TF was reformulated again as the WGNE MJO Task Force with the replacement of five members and the injection of new ideas.